Sometimes when new customers ask whether we have incense, a slightly shocked expression comes onto their faces when they see our three-tier table overflowing with choices. Yes, we have incense, it’s just that there’s . . . so much of it! Before they can bolt for the door, a Mimosa staffperson will come out from behind the counter to give a guided tour. Today, I’d like to share a little incense table tour with you in writing. First, a basic definition. Incense is essentially any herbs and other aromatics processed for burning. Incense has been used since before recorded history, for ritual, health, purification, religious offering, and to influence mental states. (I imagine Og tossing a sap-sticky log on the cooking fire, taking a deep breath, and saying, “Ooh, that smells good!”) Most incense contains aromatic materials, a binder–often acacia gum–and a little charcoal to help in burn evenly. Purer forms use plant-based mucilage to bind the scent agents, with naturally occurring cellulose taking the place of charcoal in the mixture. Incense from India: Much of the technology and tradition of incense developed in India, over the course of many centuries. Plant materials–including resins, tree bark, flowers, roots, leaves, or seeds–are mixed into a matrix of binder and powdered charcoal or wood, making a paste. Artisans dip a bamboo stick into this paste for stick incense, or form it into some sort of shape, often a cone. Sometimes it’s finished with a dip in scented oil. Tibetan incense sticks: Like Indian incense. Higher quality brands use a sandalwood stick in place of bamboo. Incense is part of traditional healing in Tibet, so their sticks tend to have a distinct herbal scent. Tibetan rope incense: In this form of incense, powder is wound into paper, and then the whole thing is twisted up to make a flexible rope, about four inches long. Comes in limited scents, but this form of incense stays fresh a long time, and is easy to take along during travel. You can set it in sand or hang it to burn. Smudge: A smudge wand is a cluster of dried leaves, usually tied with string. Sage is the most common, but juniper, cedar and sweetgrass also work for smudging, as well as blends of sage with other herbs, such as lavender. People often use it to cleanse and purify a space. One way to do this is to light the wand so that the end leaves are smoldering, then move around the room with it, touching doors, windows, and any other feature that needs special attention. When you’re done, either leave the wand in a container or snuff it out in sand or water. Resin: The oldest form of incense. If you burn a pine log and see the sap squeezing out in the heat, you’re seeing “wild” resin incense. Resin will not burn on its own, but needs a source of heat. In a modern home, that source is usually charcoal. If you have an electric oven, you can set the charcoal on the burner, turn it on, and leave it for about 30 seconds, or until a good portion of the charcoal is smoldering. A lighter works okay too. Then transfer it to your incense burner with tongs, and drop grains of resin or a little scoop of powder right on top. 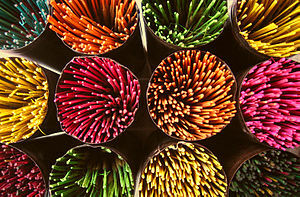 Joss sticks: Small incense sticks traditionally placed in doorways or on altars, as a blessing or offering. The word “joss” comes from Deus, meaning “God,” a word the Chinese adopted from Portuguese missionaries. Dhoop: Another variety of short, concentrated stick incense, which usually comes in a special box that doubles as a holder. Dhoop is a flexible term, and sometimes also refers to Indian cone incense. Koh: Very pure Japanese incense with a fresh, light scent. It has no wooden stick, though it’s formed into a stick-like shape. Sometimes koh is a bit thick to fit in a standard incense burner, but many brands come with their own little holder, which you can set on a plate to catch the ash. The packaging is deceptively small; a tiny package often holds fifty sticks. Botanicals: Incense made by infusing some kind of a standard incense, often sandalwood, with essential oils. It’s sweet, but in a fresh way, not cloying. Some blends have magical names like “Moon Goddess,” while single-ingredient sticks feature plants, sometimes uncommon ones. Botanical incense is often chosen for its magical properties. Incense of the West: This is a brand, rather than a variety of incense, but it deserves mention because it’s unlike any other incense we carry. It comes in a squat sticks that burns like a cone, with uniquely American scents like mesquite and balsam fir. Strong, fresh scent. Incense burning is a healthy practice, as long as we use common sense. Burn just enough to make the room fragrant, not smoky, and leave a window open at least a crack when the weather allows. And of course we’re dealing with fire here, so be careful about leaving incense unattended, especially if there are pets or small children about. If you are sensitive to incense or smoke, and oil burner or reed diffuser might be a better choice, but botanicals and Japanese koh incense burn clean enough to work for all but the most sensitive. Each incense has traditional associations through plant magic, often including medicinal properties. We have more information about this available in the store, and plan to put more information online soon.